Purpose: The study aimed to evaluate the effects of iron (Fe) availability on physiological and biochemical responses of salt stress in two apple species (Malus xiaojinensis and Malus baccata). Design: The experiment was conducted under growth chamber conditions in a completely randomised design with three replications. Apple seedlings were exposed to 0 and 75 mM NaCl with either 100 mM Ferrozine (2Fe) or 40 mM FeNaEDTA (1Fe) in Hoagland nutrient solution. Roots and young leaves were collected after 0, 1, 3 and 6 days of treatments. Findings: Under iron deficiency, salt stress increased the expression of MdSOS1 and MdAPX1 genes in roots and leaves of M. xiaojinensis and decreased the expression of MxFIT, MxIRT and MxHA2 in roots, while the expression was slightly increased in M. baccata. Rhizosphere pH of both genotypes was increased by salt stress under examined iron levels. Under iron deficiency salt stress accumulated less Na1, H2O2 and leakage in electrolyte, and more Fe21, K1 in M. xiaojinensis tissues compared to M. baccata ones. Value: The findings indicated that under salt and iron stresses M. xiaojinensis tends to absorb more Fe21 compared to M. baccata. Iron deficiency has a positive influence on M. xiaojinensis and could be used to minimise the negative impact of salt stress and thus contribute into enhancing salt stress tolerance. Reference to this paper should be made as follows: Babiker, S.I., Zhang, M., Liu, W., Wang, Y., Wu, T., Zhang, X. and Han, Z. (2017) ‘Evaluation of the Iron Contribution to Salt Stress Responses of Two Malus Species and its Possible Mechanisms’, Int. 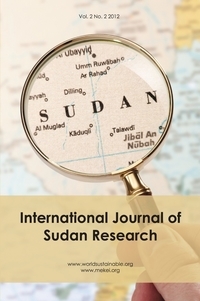 J. Sudan Research, Vol. 7, No. 1, pp.15-29.